Another Blowback Airsoft pistol added to the Canada Replica Airguns Store and this one won't break the bank! 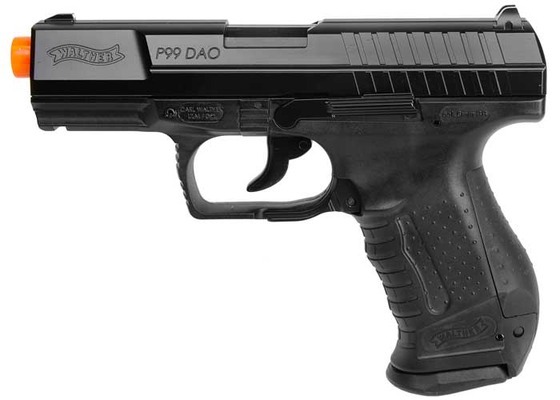 The Umarex Walther P99, one of Walther's most popular semi auto pistols. This CO2 powered Airsoft version captures the realism with its BLOWBACK, semi-automatic action and full metal slide. A 12g CO2 cylinder loads in the back of the grip and the Airsoft BB magazine releases with the push of a realistic magazine release lever. The recoil action made live by the power of CO2 kicks the slide back giving you that oh-so-realistic feel. A great pistol for Target, Airsoft Games and owners of the P99 or similar firearms.